This article is about the character, Starfy. For the video game series, see The Legendary Starfy (series). Starfy (known in Japan as Sutafī, officially romanized as Stafy, also appearing as Stafi on the Canadian Copyrights Database) is the main protagonist of The Legendary Starfy series. He is the prince of the Pufftop Kingdom, along with his best friend, Moe the clam, and his younger sister, Starly. They all live in the Pufftop Palace but Moe also has a house of his own. Only Starfy can perform the Air Jump, the Powerful Spin (which involves spinning with Moe, though it can be used when Moe isn't present, suggesting that the ability doesn't necessarily involve the real Moe), the Mighty Star Spin and the Ultra Star Spin. According to the lyrics of all versions of the series Title Song except for Perfume's, he is 36 cm tall and 7 years old. He is voiced by Satomi Kōrogi in Japanese commercials and The Legendary Starfy. His hobbies include collecting sunglasses and making pretend transformations. According to Hitoshi Yamagami of Nintendo, Starfy is a "kind of mysterious creature that is somewhere between a starfish and a real celestial star", even though he is called a starfish in The Legendary Starfy. In Starfy's Japanese Super Smash Bros. for Nintendo 3DS trophy description, he is referred to as a creature like a star who looks like a starfish. In an official translation, of the trophy description, it says that nobody knows what species Starfy really is. Starfy is a nice and friendly character who likes to solve other people's problems. Starfy smiles almost all of the time, and this may portray him as a content and relaxed person. Although Starfy shows negative emotions such as sadness and fear, these are shown often only for a short time. His best friend Moe gave him emotional support to stop crying in Densetsu no Starfy 2 after his mother Mama Star was kidnapped by Ogura, and Moe tried to raise Starfy's spirits in his room when it was revealed that Mattel; Starfy's crush was engaged to Coral. In The Legendary Starfy, Starfy may come over as childish in the way that he makes high pitched squeals when he is happy. Starfy is apparently very forgetful in the way that he forgets most of his abilities for each game and has to relearn them. Starfy is also very lazy, even though according to his Super Smash Bros. Brawl trophy he tries his hardest when he sets his mind to something. In The Legendary Starfy, according to a Pufftop Guard, he gets up to eat a late breakfast, takes a nap before he goes out to play, takes a second nap, eats lunch and then has another nap. Starfy likes to use the Story option to look back at his adventures. According to Starly's trophy from Super Smash Bros. Brawl, Starfy is sometimes spineless, and this may be supported by how Starfy ran around freaked out and hid inside of Moe's shell when debris started to fall during the opening of Densetsu no Starfy 2, after Ogura had escaped from the jar with the help of the Puchi Ogura. Starfy occasionally shows to be brave though, through being persistent in his efforts and through fighting bosses. In the Densetsu no Starfy R manga, a good example of how Starfy can come across brave is in the final chapter, "For Those Whom I Must Protect......" where Starfy went into the sky to puncture a hole in a meteor and pushed it off course, but it is possible that Starfy's desire to help Mattel by saving the Amiy Kingdom influenced Starfy. Though Starfy likes adventure, he acted against starting an adventure in Densetsu no Starfy 3. In the beginning of Densetsu no Starfy 3, Starly was the first one to take action and do something about the problem surrounding how the jar was destroyed and the fact that Ogura's personage (Evil) was around. She forced Starfy and Moe into their third adventure by pushing them into the ocean while they resisted. In The Legendary Starfy, Starfy was eager to help Bunston from the start after he crashed through Starfy's room and ran away. Starfy went off the edge of Pufftop even though Moe grabbed Starfy and tried to stop him. In a 2009 teleconference between Nintendo/TOSE and Nintendo Life, Kazuki Yoshihara states that Starfy has grown to be "less of a crybaby" than in the first game, and states that he's "a bit more grown up in the way that he helps out the other characters in the game". . In an unofficial manga based on The Legendary Starfy called Defeat the Enemy! though, Starfy was too scared to fight a group of fish resembling Fwips, and Starly had to step and spin him around so he could defeat them. Starfy is described in the lyrics of the series' Title Song and his Super Smash Bros. Brawl trophy as being a "little spacey and clumsy", and this can be supported by the fact that in the beginning of Densetsu no Starfy Starfy walked around Pufftop Palace and carelessly knocked over the jar, apparently being unaware of his surroundings. Additionally, after Starfy successfully defeated Ogura, trapped him back inside the jar and returned to Pufftop, he knocked over forty five treasure chests while wandering around, so this caused Moe to chase Starfy and this lead to Starfy knocking over the jar again. Starfy proved to be persistent however by collecting all forty five Treasure Items, trapping Ogura in the jar again, and temporarily bringing peace back to Pufftop. Starfy has a liking for treasure, but not as much as Moe or Wario. Starfy's hobbies include collecting sunglasses, and according to ℃-ute's version of the series' Title Song, making pretend transformations (either referring to wearing Stuff; as the video shows Starfy wearing Stuff after this line, or the transformations/vehicles Starfy uses in the game. Starfy's other hobby could also be both). Starfy may come across as eccentric in some cases. In chapter one of the Densetsu no Starfy R manga ("Starfy's Love Attack"), Starfy wore spiral glasses, a "hissho" hachimaki headband and a thick tattered suit in Pufftop Palace after he developed a crush on Mattel. In chapter two ("Super Difficult! Love of a Young Girl") and chapter five ("Holy Place of Otaku, Viva! Akiba!! "), Starfy wore a peculiar suit with spiral glasses, a 'head handkerchief', a striped jacket and a shirt with a character on it. In chapter five, Starfy thought that the Fii remotes in a shop were used for knitting rather than hitting a ball on the screen with rackets and knitted a cloth. Starfy shows respect for his younger sister Starly as well as Moe. In Densetsu no Starfy 3, in area 2 of Misty Town Starfy duck and slided into some falling knives and chairs so that he would take the 'attack' instead of Starly. Starfy was on the receiving end of physical humor in this case, as after Starly blew up the chairs and knives with a bomb it turned out that he was fast asleep the whole time. According to Smash Bros. DOJO! !, the fact that Starfy came to Super Smash Bros. Brawl is "part of his charm", but it is not clear exactly what the writer means. Starfy is never shown to be angry or aggressive in the games, though rarely he may pull a face of dissatisfaction, including when Moe ran away in Densetsu no Starfy 4 before Arasoinomon revealed itself. Starfy may be angry or aggressive in other media including manga and commercials, but not always and he has good intentions at heart. In chapter 4 of the Densetsu no Starfy Yumiko Sudō manga ("I Hate Old Man Lobber Fii! "), Starfy was mad at Old Man Lobber for giving him a coconut (it is assumable that he did not like it), and tipped up his table, but after Starfy and Old Man Lobber became separated after being swallowed by the whale, Starfy cried when he saw the coconut with teeth marks on it, thinking of all the good things Old Man Lobber had done for him. In chapter 7 of the Densetsu no Starfy R manga ("Pufftop Kingdom, Game King Playoff"), Starfy and Starly both pulled an angry face near the end of the story when debating on what the best games console is but Moe came to calm them down and let them agree that both the FS and Tenkaido Fii are equally good. In a commercial for Densetsu no Starfy 4, Starfy was shown to be angry when Mattel called out for help, raising his arms to show muscles and pulling an angry face with his teeth together on the way to the Amiy Kingdom. In another commercial, after Degil raised the Mon Amour Stone, this made Starfy angry, having him raise his arms to show muscles and be surrounded by a red spiky glow. Starfy goes on his first adventure during the events of Densetsu no Starfy. Starfy was moving things around his home, until he dropped a jar that sealed Ogura, which fell into the ocean. After the jar fell, thunderstorms and tornadoes blew Starfy into the ocean. Many new friends, such as Moe and Old Man Lobber, helped Starfy to get back to Pufftop Kingdom and told him about Ogura, and Starfy and his friends fought and sealed Ogura back into the jar. Starfy starts out on yet his second adventure, as he falls from Pufftop once again, along with his best friend, Moe. Also, his mom, Mama Star gets kidnapped by Ogura. Yet again, Starfy falls to a exciting adventure, this time along with Moe and his sister, Starly, who Moe calls a "pink powder keg". The Amiy Kingdom is in trouble and Starfy and friends have to help the citizens of Amiy Kingdom. Starfy meets and helps a mysterious bunny during the events of The Legendary Starfy. One day, Starfy was having a peaceful nap, then a strange bunny crashed through the roof and landed on Starfy. Starfy stared and tried to make the unexpected visitor talk, until three shadowy goons crashed through the walls and tried to kidnap the bunny. Starfy became angry and used his Star Spin move on the goons, which made them run away. Moe entered Starfy's room and told him that the strange bunny figure jumped into the ocean, so Starfy and Moe went after him. Once Starfy and Moe entered the ocean, they found the bunny, who was called Bunston. He had amnesia and the only way to gain his memory back was by finding shards. Starfy, Moe, and Bunston (sometimes Starly too) had to travel to Gluglug Lagoon and many other places to find every shards. Along the way, the shadowy goons, which was revealed to be a team of Snips, Ronk, and Papes, tried to kidnap Bunston and stop Starfy and Moe from getting all of the shards. Bunston's memory returned and remembered that he was a prince and his planet Bunnera was in danger by the evil Mashtooth, so he used the shards to fix his rocket ship and he, Starfy, and Moe traveled to Bunnera. When Starfy, Bunston, and Moe entered the Bunnera Castle, Starfy dueled with Mashtooth and won, until Mashtooth absorbed Bunston's power and transformed into Mega Mashtooth. Starfy and Moe got beaten up by Mega Mashtooth until the Terrible Trio came and helped Starfy. Many of Starfy's friends cheered Starfy on, which gave him the strength to face Mega Mashtooth. Starfy pushed the Bunnera moon at Mega Mashtooth, which defeated him, gave the Bunnerans their powers back, and made Bunnera back in peace. Moe: It's the Moe Show...with me, Moe! And yowza, have we got a show tonight! Tonight's guest is the prince of Pufftop himself! Starf, come on out here. Starfy, how're you feelin' about this adventure? Lay it on us. Whoa, whoa. What's with the sunglasses? Heyyyy, pretty fancy. Brand-new? A fashion designer made 'em for ya? Sheesh. You some kinda movie star now? I bet you can't even go outside without getting mobbed by your fans! Heh, just ribbin' ya, Starf! Before the announcement of The Legendary Starfy for North America, there was no official localization for Starfy's name. When romanized, "スタフィー" can be represented as Sutafī (Sutafii), but an official romanization of his name as seen in the URLs of the official Nintendo Space World webpages, the Densetsu no Starfy Staff Credits, the ROM headers of the games, a Yoshi Theater poster in Mario & Luigi: Superstar Saga, three of the stuff in Densetsu no Starfy 2 ("Stafy" is written on the following items: "Uniform", "Wrestler Clothes" and "Baseball Cap") and in Super Smash Bros. Brawl is "Stafy". Likewise, Starfy's younger sister Starly is referred to in Super Smash Bros. Brawl as "Stapy". 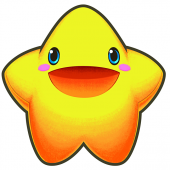 Regardless of the official romanization, Starfy was referred to as other names, including "Sutafi", "Stafi" (also appearing like this on the Canadian Copyrights Database) and "Starfi" and sometimes still is after the localization of his name to "Starfy". On February 26, 2009, Densetsu no Starfy: Taiketsu Daiiru Kaizokudan was announced to be released overseas on June 8 2009, via a list of upcoming video games on the Nintendo's Online Press Room website as The Legendary Starfy. This new title as well as a section on the page talking about the gameplay confirmed Stafy's North American name as Starfy. Starfy appears in Super Smash Bros. Brawl, where his primary appearance is as an Assist Trophy. Starfy reappears in Super Smash Bros. for Nintendo 3DS and Wii U as an Assist Trophy in both versions. 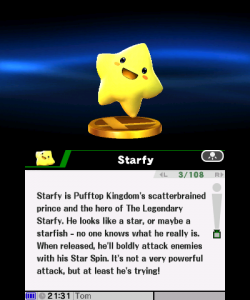 Starfy ("Stafy")'s primary appearance in Super Smash Bros. Brawl is as an Assist Trophy. An Assist Trophy is item that allows players to have another character help them in battle. Starfy is known as one of the weakest Assist Trophies. Playable characters can attack and push him off the stage, unlike other Assist Trophies. Starfy's only method of attacking is using Star Spins. When Starfy appears, the sound effect heard at the beginning of the tune Confrontation with the Boss in the first four The Legendary Starfy series games plays. Additionally, both Starfy and his younger sister Starly (called Stafy and Stapy respectively) appear as regular trophies, and Starfy, Starly, Moe (Kyorosuke), Chonmagyo, Mattel (Materu), Seiuchi-kun and Herman (Yadokarita) appear as stickers. There are two Starfy stickers. The first sticker depicts the official artwork of Starfy swimming from Densetsu no Starfy. The second sticker depicts the official artwork of Starfy wearing one of the Stuff (possibly the Aloha Shirt) from Densetsu no Starfy 2. The Starfy trophy is obtainable by clearing Target Smash!! Level 1 with at least 10 different characters. The Starly trophy can be unlocked randomly. The prince of the kingdom of Tenkai. He's a bit spacey and clumsy, but when he sets his mind to something, he gives it his all. Stafy gets help from his friends Kyorosuke the clam and the wizened Lobjii-san. Stafy sometimes dons a pig suit and throws pork cutlets. In Densetsu no Stafy 3, Stafy meets Wario and goes with him to steal the treasures of the deep. Starfy Assist Trophy in Super Smash Bros. for Nintendo 3DS. Starfy is an Assist Trophy in both Super Smash Bros. for Nintendo 3DS and Wii U, as he is in Super Smash Bros. Brawl. Like Super Smash Bros. Brawl, Starfy walks around the stage and performs Star Spins before disappearing or falling off the stage. He can be attacked and can receive knockback in both the Nintendo 3DS version and the Wii U version. If defeated, he may tumble in the air while turning around clockwise with his back facing the screen, but the melody that normally plays in the Legendary Starfy series when Starfy or Starly is defeated does not play. The melody based on the beginning of Confrontation with the Boss from Super Smash Bros. Brawl also plays when Starfy appears in both the Nintendo 3DS and Wii U version. Starfy re-appears as a regular trophy in at least Super Smash Bros. for Nintendo 3DS, as originally seen in a pre-release screenshot of All-Star Mode that was posted by game director Masahiro Sakurai on Miiverse. Among the places the Starfy trophy can be obtained include Classic Mode, the trophy shop, and possibly on the ground, as seen in the previously mentioned screenshot. Additionally, Starfy appears as a profile icon among other Assist Trophies. 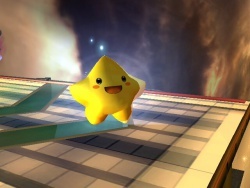 On December 25, 2013, it was first revealed that Starfy would appear in Super Smash Bros. for Wii U via a picture of the day on the official Smash Bros. website, showing Starfy, a yellow Luma and Pikachu. The picture of the day was also posted on Miiverse with the text "Pic of the day. Yellow characters." (Japanese: きょうの一枚。 黄色いいきものたち。, Picture of the Day. Yellow Creatures). Starfy's status in the game remained unconfirmed for a while, as the picture of the day did not confirm he was an Assist Trophy, and there was no page for Starfy as a new character on the site. Later, two screenshots of Starfy appeared on the Mario Galaxy and Town and City stages, apparently as part of a press package release. Screenshots from it were uploaded to Flickr by 'Endless' in the first quarter of 2014. Starfy was confirmed as an Assist Trophy appeared during E3 2014 demo footage on the 10th of June, including the Super Smash Bros. Invitational tournament, where he appeared in matches. Like in Super Smash Bros. for Nintendo 3DS / Wii U, Starfy appears in Super Smash Bros. Ultimate as an Assist Trophy. Additionally, Starfy (using his The Legendary Starfy artwork) appears as a spirit in Spirit mode. Early artwork from Densetsu no Starfy when it was under development for the Game Boy Color It appeared at Space World's 2000 and 2001 software showcase. Satomi Kōrogi, the voice actress for Starfy is also known across Nintendo for providing the voices of several Pokémon and characters in the Pokémon anime and Super Smash Bros. series including Togepi, Pichu and Mew. In Super Smash Bros. Brawl, the trophy of Starfy ("Stafy")'s sister Starly ("Stapy") is indexed under the "Fighter Related" category even though Starfy is not a playable character in this game. Furthermore, no Custom Robo or Animal Crossing trophies appear in the "Fighter Related" category even though Stafy, Ray MK III and Mr. Resetti all appear as Assist Trophies. This has lead to speculation that Starfy may have once been planned as a playable character in the development of Super Smash Bros. Brawl. Starfy's name in South Korea is '스타피' (revised romanization: Seautapi). In The Legendary Starfy, Herbert refers to Starfy as a "Starfy look-alike" when Starfy first meets him. ↑ English Miiverse post by Masahiro Sakurai (archived from the original). ↑ Japanese Miiverse post by Masahiro Sakurai (archived from the original). Defeat the Enemy! • Hidden Room Discovery! • Combined by Transformation! This page was last modified on 6 April 2019, at 19:32.